Order a made up sample model hereMeasuring 22" square Log Cabin Star is beautiful & traditional! 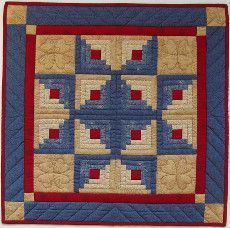 This charming wall quilt brings together "Log Cabin" and "Star" patches two favorite themes of quilters throughout the years. Quilted hearts fill the plain blocks surrounding the star. Kit includes all 100% cotton fabrics needed to complete the quilt (including quilt top backing and binding) plus batting precise patterns complete instructions and quilting designs. Colors are colonial blue red and sand.